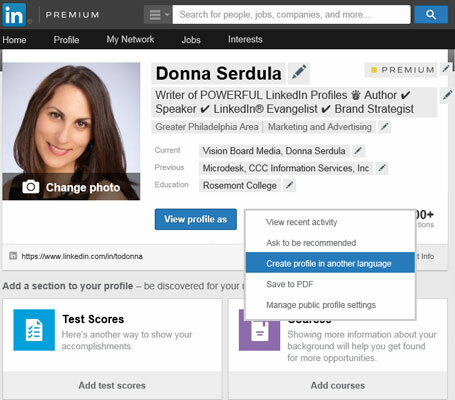 For those global business people who work throughout the world, you can make multiple versions of your LinkedIn profile in different languages. This way, the person viewing your profile sees your profile in the language that matches his or her primary language. If this person is using LinkedIn in a language that doesn’t match any of your languages, he or she sees your profile in your primary language. LinkedIn doesn’t automatically translate your profile; you are responsible for editing your profile and adding the translated text yourself. Click the down arrow next to the View Profile As button and select Create Profile in Another Language, as shown. Choose a language from the drop-down list. If your first name and last name are different in the new language, update your name in the First Name and Last Name fields. In the Professional Headline field, update your headline in the new language. Click the Create Profile button to go to the Edit Profile page of your new language profile. You are now at the new secondary language profile. Your original profile sections have been transferred to the new secondary language profile with the titles, company names, and recommendations intact. When you click into sections, the descriptions remain; you must delete the content and replace it with your translation. Once the original primary language is deleted, LinkedIn provides your primary language text below the fields to aid you in translating. Refer back to the chapters of this book to optimize your profile in your new language. Creating a profile in another language.